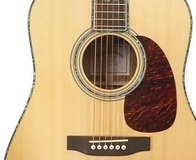 Takamine F360 - "Takamine F360S Dreadnought: "Something to look for?"" Fender CD-60 [2006-2010] - "One Of The Best Guitars You Can Get"
Power Play KSP210 - "Acoustic Guitar / Bow and Arrow!" Kinny Stereo Acoustic Guitar - "Simply Beautiful tones"
Epiphone MD-100 - "MD-100 Gibson Epiphone Resonator Guitar"
Martin & Co DM - "Martin DM"
Falcon FG100 - "It's a perfectly reasonable starter guitar"
Yamaha FG820-12 - "A Great Guitar--what a 12-string should be!" Takamine GD10CE-NS - "An excellent value-for-money and a surprising electric-acoustic sound"
NK Forster Guitars Model C-HO - "Perfect for DADGAD"